My goodness what a final! If you haven’t watched the Great British Bake Off presented by the hilarious Mel and Sue I suggest you catch up NOW! I love this show, amateur bakers from across the country battle it out to win the accolade of Best Amateur Baker. Blimey it’s great. Nail biting stuff. After the final I really want to experiment with Mary Ann’s decor paste stripy sponge cakes. She has set up a food blog which is doing incredibly well already. 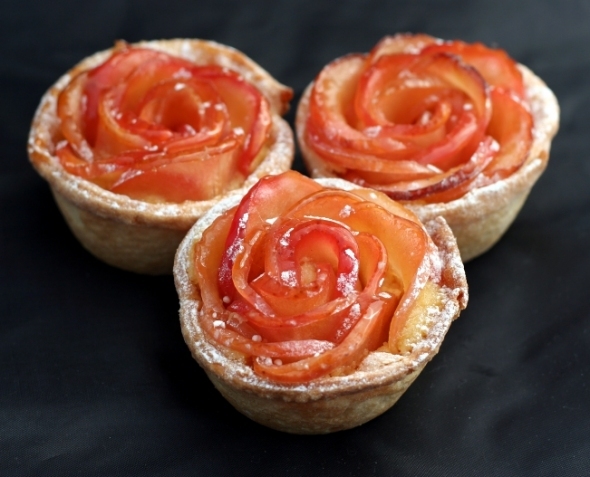 Check it out here to see her rose apple tarts that won her high praise on the show and look so beautiful. Not always one for delicacy Mary Anne really pulled these out of the bag! Add the pancetta about 7 mins in and brown it lightly. Add the olives and chilli flakes and stir to just release their fragrance (turn the heat up for a bit) then add the 2 tins of chopped tomatoes and the sugar. Stir, put a lid on, turn the heat right down, and forget about it for at least an hour. 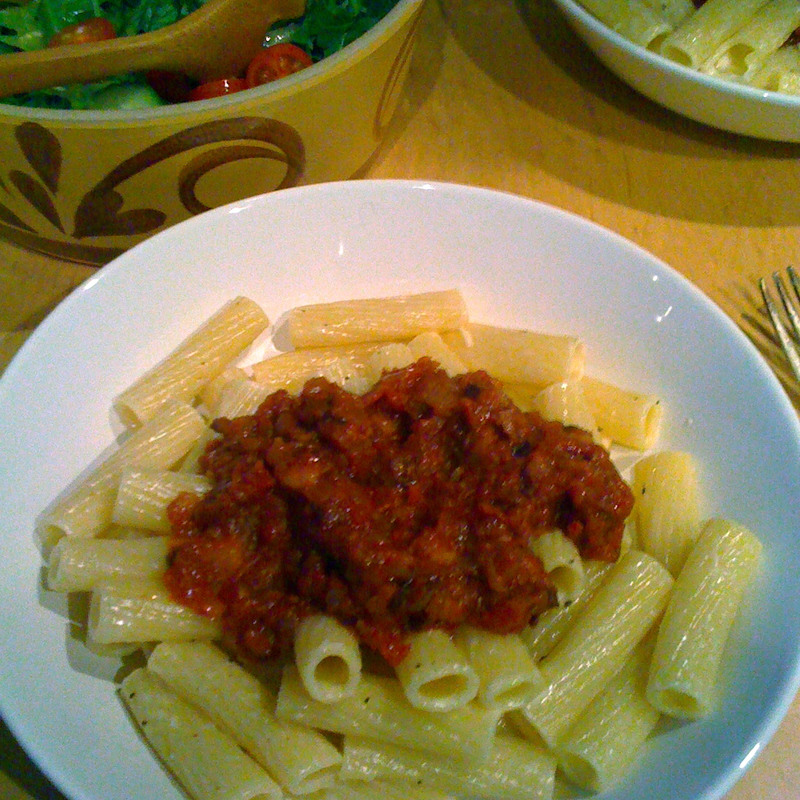 Remove the lid and stir, continue cooking for another 30 mins until the sauce has a lovely thick rich red intensity to it. Add pepper last (if you add pepper too early it starts to taste bitter) check for salt as the olives will have done some of this for you and adjust. Meanwhile cook the pasta in a large pan of salty water and when it’s done, quickly drain (reserving a tablespoon or so of water) set aside and chuck into the hot pan the knob of butter and garlic, swirl for 30 seconds until then add the cream parmesan and pasta. Coat the past in this garlic cream sauce, loosen with cooking water and serve immediately with a few spoonfuls of the tomato sauce on top. Obviously the creamy element is optional (and is actually perfect on its own) but I like to combine the creamy intensity of the pasta with the rich tang of the sauce. This way it also means you’ll have plenty of sauce left over for impromptu suppers, like ours last night. Sorry for dreadful picture. Will update when I next make this recipe.